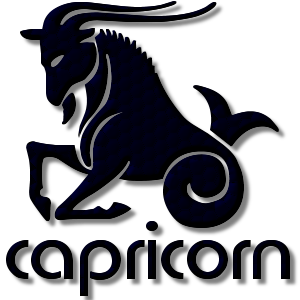 Add a Capricorn The Sea Goat Zodiac stampette to your Facebook and Twitter profile images and show your star sign. In Greek mythology Capricorn is shown as a goat with a fishes tail, which comes from earlier Egyptian and Babylonian traditions. When Pan, the goat like god, was attacked by the monster Typhon, he dived into the River Nile to escape. Above the water he remained a goat while below the water he became a fish. The symbol of the goat rising from the body of a fish also represents the mountainous buildings of Babylon emerging from the marshland around the Tigris and Euphrates rivers.